We have created a slew of new charts in the annual update of this website. Today, Craig Morris focuses on two of them concerning power prices and so-called energy poverty. “The exact number is around 350,000,” I answered, “and we know this because the country’s Network Agency publishes the figure every year.” I then asked the group whether that number was high or low. For instance, how many households in Canada or the US had their power cut off for failing to pay the bills? As we pondered the irony of energy experts not knowing statistics about their own countries that they know about Germany, I put the numbers into context. “That’s 0.9 percent of the 39.9 million households in Germany.” Still, how does that performance stack up internationally? The visitors to Germany did not know because other countries don’t always publish their statistics. Whenever the US press reports on such matters, we get a hodgepodge of numbers from particular utilities. Usually, we are only provided with the number of households affected (such as 70,000 in Memphis over eight months) without any indication of the percentage. Another example: 91,000 households in Iowa (equivalent to seven percent of all households in the state) received disconnection notices in the fall of 2015. There are on “energy poverty” for the US as a whole. Judging from this article, Canada does not collect official statistics either (but please drop us a link in the comment box below if you know better). We simply know that a bank survey of Canadian households with incomes of at least 50,000 CAD found that 40 percent had trouble paying their monthly energy bills at least once in 2014. That’s not the same as having your power disconnected, of course, but the numbers tally roughly with Australia as well—and again, the statistics are based on a survey, not official government data. The best comparison I know of is from Eurostat, and it makes Germany look quite good indeed. Here, we see the number of households unable to pay monthly energy bills (not just electricity) on time. The US protects its poor less, with utility firms sometimes cutting people off when they are only 30 dollars behind—and then charging hefty sums for re-connections, up to five times more than in Germany. Furthermore, while prices may be higher in Germany, bills are not necessarily, because North Americans consume so much energy. There are many other countries in the original data set here, but we focused on this group to improve readability. Germany is not the leader in the entire list; it comes in seventh out of a list of 33 countries for 2014. The only countries to perform better were the usual Nordic and Germanic places with strong economies and welfare systems: Switzerland, Austria, the Netherlands, Norway, Sweden, and Luxembourg. In 2014, 4.2 percent of German households were in arrears on their monthly utility bills at some point, but only 0.9 percent actually had their power cut off. Numerous parameters are at play here in addition to the price of electricity. For instance, France prevents its utility firms from cutting off power, gas, and electricity to people who cannot pay. Obviously, welfare—and more generally, protections for the poor—play as great a role as power prices. 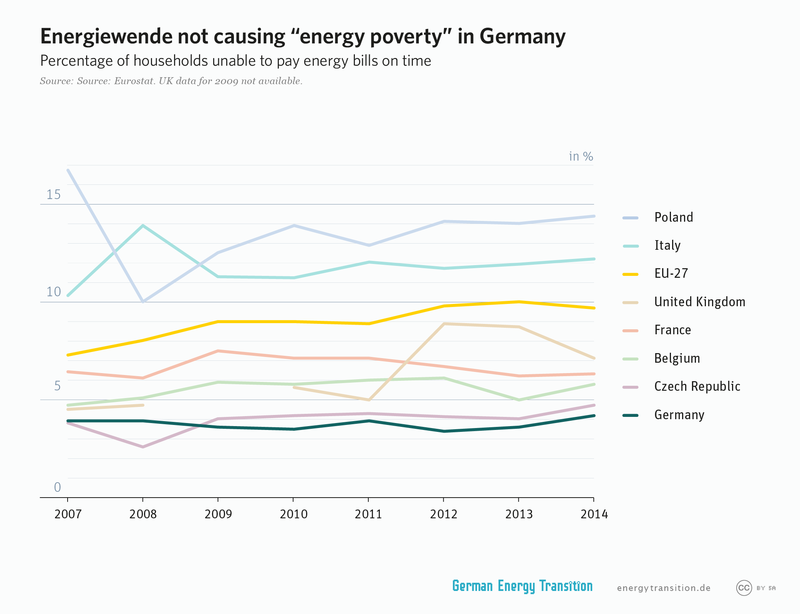 In addition, no articles I have seen on alleged “energy poverty” in Germany have ever pointed out that practically all disconnected households got power again after just a few days. It’s also important to remember that electricity prices alone are only part of the picture. Since 2000, they have doubled, but overall the cost of natural gas and heating oil have risen even more since 1990, as the following chart shows. In the end, it’s crucial to understand why I keep writing “energy poverty” in quotation marks—it does not need to exist as a term. It is only a subset of poverty, which needs to be the focal point of social policy. High energy prices are good in that they incentivize conservation and efficiency. The poor need to be protected from these high prices to some extent, but that falls in the domain of social policy. Low energy prices should not be the goal of energy policy. Craig Morris (@PPchef) is the lead author of German Energy Transition. He directs Petite Planète and writes every workday for Renewables International. He is co-author of Energy Democracy, the first history of Germany’s Energiewende. Love the information very much, persuading! Thank you. Excellent graphics as usual, however why are they no longer clickable (to enlarge)? You are combining analysis with your own social ideas, some of which have this flavor of stentorian Calvinism [“Low energy prices should not be the goal of energy policy.”] There is no rational reason why prices should not be “low;” that leaves more money in the pockets of the average guy, including the working poor and the poor, and thus is one social tool to combat the spread of destitution. Your citations to Memphis and Iowa are not nuanced. Memphis is a very poor city, largely of migrant blacks from the Deep South (specifically, Mississippi and Louisiana), and sits inside a State with a very conservative if not redneck government structure. It is unsurprising that that population receives larger numbers of shut-off notices: the population is poor. It is also kept poor by various social and government policies, including those of default. Iowa despite its supposed rural flavor is, or was, surprisingly industrialized, and the collapse of the manufacturing sector post-NAFTA with its plants moving to Mexico has left deep swaths of poverty. So again, it is unsurprising that Iowans get both shut-off notices and actual shut-offs from investor-owned utilities, given that those farm States have little in the way of social programs. Meanwhile, Germany does well not because of some brilliance of its planners, but because it is the industrial powerhouse of Europe. Simply put, overall, the people make more money than in say Poland. It also does well due to the dismantling of tariff barriers in its large customer, the USA. Impose a 17% tariff wall and let’s see how you make out. Won’t be pretty. 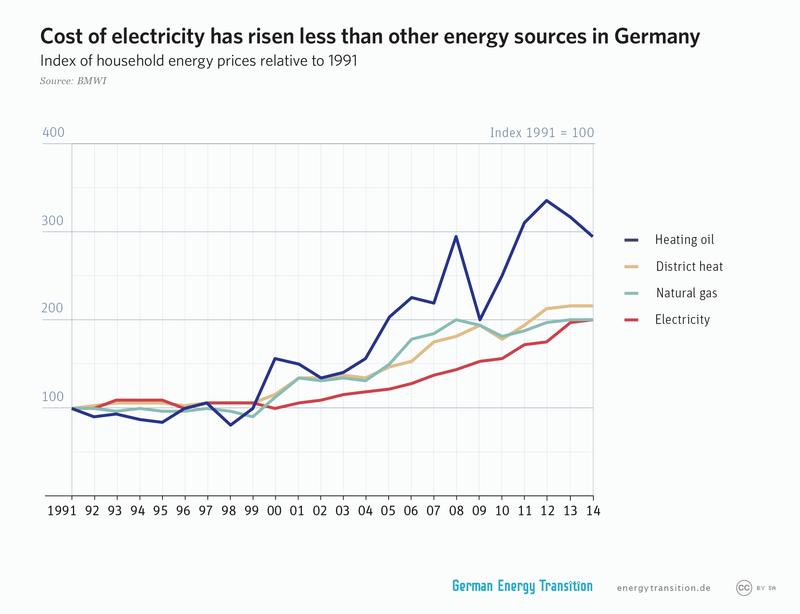 Also, if green energy is supposed to be cheaper, why are so many Germans having a hard time paying their electic bills? As he illustrated, energy bills have doubled since 2000, and keep rising. Why is that if they are using supposedly cheap, renewable energies?? I am conducting research on the concept of energy poverty, with a focus on the effects of monopoly energy markets in the United States. If you have any information regarding this topic, or any resources you would recommend, I could use it. The cost of energy is a major factor in manufacturing costs. High energy costs drive companies to relocate in other countries with lower costs. That alone is a reason to have low energy costs. It fuels employment and prosperity. To say that low energy costs should not be a goal is astonishingly naive and illogical. High energy costs for consumers also shrink the market for manufactured goods by removing money from the consumer’s purse. Interesting that you should mention Canadians as members of “a group of North Americans who had come to Berlin to see what they could learn from the German energy transition.” Canada can learn nothing from the laggard Germans regarding low-carbon power production. Based on the most recent data, 51% of German electricity is generated using fossil fuels while in Canada only 20% is. What, exactly, would Canada expect to learn from the German Energiewende? One possible takeaway might be the escalating price of electricity in Ontario thanks to the provincial government’s foolish embrace of wind and solar despite the province historically generating 80% of its electricity emissions-free by means of hydro and nuclear. It is no coincidence that, just as in Germany, residential consumers have felt the pinch as more and more renewables are added to the mix. They have borne the cost without any measurable benefit. Ontario’s economic competitiveness has suffered, a recent study determined that 75,000 manufacturing jobs have been lost due to the effects of the province’s own Energiewende. This mirrors the German experience where jobs in energy-intensive industries are being lost to less expensive jurisdictions. Energy costs do matter, they are not just a concern of social policy. Energy poverty might be an inaccurate term, but overpriced energy is a real problem for increasing numbers of people and is a real contributor to increasing levels of poverty generally. The lesson to be taken from Germany is that the great energy transition has proven to be a costly failure. Canada and the rest of North America would be well advised to seek counsel on energy matters elsewhere. Pingback: High German power prices, low monthly bills?